Every dog owner wants to have a strong bond with their dog, and often think that loving their dog is the same thing as bonding with their dog. Both are distinct parts of the human-dog relationship. The love between you and your dog develops naturally, whereas having a bond with your dog takes time and effort to develop. Developing a bond with your dog begins as soon as you bring your dog home, and it continues to grow over time. Every relationship takes work, and there are ways that you can strengthen that bond throughout your dogs life. Read on to discover the 11 tips for bonding with your dog. Strong bonds don’t happen overnight, they take time to build. Spending quality time with your dog is a great way to share experiences that will strengthen your relationship. Time spent together includes exercising together, and relaxing together. When you walk your dog, take the time to explore together and enjoy the fresh air and surroundings. Instead of making the walk feel like a chore, with you talking on your phone, interact with your dog and enjoy the experience together. If you always stick to the same walking route, try changing it up to prevent your dog or yourself from getting bored. Just hanging out with your dog will strengthen your bond. It doesn’t always have to be a physical activity, it can just be relaxing together on the couch. By spending time with your dog, you will build trust, confidence and love. All dogs love to play, and they enjoy playtime even more when it’s with their best friend, you! When it comes to playtime, don’t just toss a tennis ball out in the yard and expect your dog to entertain himself. Join in on the fun. Playing games with your dog and having fun will strengthen your relationship and build a better bond. Make sure to play games that your dog enjoys. Some suggestions are tug-of-war, fetch, hide-and-seek, and puzzle games. By joining in on the playtime, your dog will see you as fun to be around, and will want to spend more time with you. As the saying goes, the way to a man’s heart is through his stomach. Well the same can be said about dogs. Feeding your dog healthy, and nutritious food, that your dog truly enjoys will make your dog happier and healthier, and if all the food comes from you, your bond will strengthen. Don’t just free feed your dog by leaving a bowl of kibble out all day for your dog to eat from whenever he likes. Make mealtime a time for training, by feeding some of his food by hand. 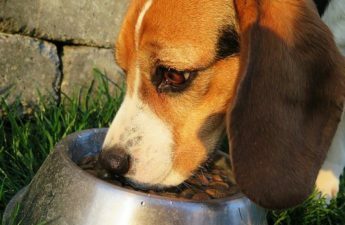 Not only will hand feeding slow your dog down from eating too fast, but your dog will see you as a provider of all good things. A simple but powerful way to bond with your dog is through eye contact. 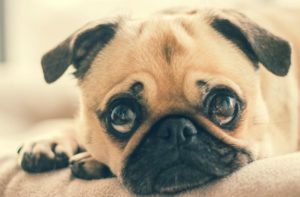 Teaching your dog to make eye contact with you is one of the best ways to get your dogs attention, and for your dog to focus on you. By getting your dog to make eye contact with you, it will make communication and training easier with your dog. Eye contact with your dog is great for training, but it is also helping to build a strong relationship. When you and your dog lock eyes with each other, it releases a feel good hormone called oxytocin. Oxytocin is often referred to as the love hormone, and it is associated with feelings of trust, and plays a role in bonding. Training your dog is a great way to bond. Whether you’re teaching your dog some new tricks, or working on mastering basic obedience skills, you should always implement some training into your dogs daily routine. Dogs love having a job to do, and that can be simple things like getting your dog to sit or give paw before you give him his food, or getting your dog to sit before you cross the street on your walks. Being consistent with your training and house rules will establish trust and respect. Your dog will learn what behaviors are expected of him and what is not okay. Make sure everyone in your household is on the same page with the rules. If your husband allows your dog on the furniture, but you scold your dog for it, your dog will become confused and won’t know who to listen to, and will lose respect for you. Each dog has their own unique personality. The more time you spend with your dog the more you will learn about what your dog likes and dislikes. If your dog prefers to have his own space to rest instead of cuddling up next to you, you need to respect that. Some dogs enjoy cuddling while others prefer space. Some dogs love to play tug of war, while others would rather chase a ball. Just like humans, dogs like and dislike certain things, as well as other dogs, and people too. I’m sure you would rather have your teeth pulled than to spend the day with someone that you can’t stand, well the same goes for your dog. Some dogs just aren’t compatible with each other, and you should never force your dog to play or hang out with another dog that he doesn’t like. There are many things that you may assume that your dog likes, when in all reality your dog may just be tolerating it. For instance, you may love giving your dog hugs, or putting clothes on your dog. That’s fine if your dog likes that, but some dogs barely tolerate or dislike that all together. By paying close attention to how your dog responds to certain things and situations, you will learn what your dog likes and doesn’t like. You may find that your dog hates being hugged, but really enjoys belly rubs, so why not swap out the hugs for something your dog enjoys. By knowing your dogs individual likes and dislikes, and respecting them, your dog will be able to trust you more, and your bond will strengthen. It’s so important to always remain calm and keep your cool around your dog. Even if you are having a bad day, you should never take out your frustrations on your dog. Yelling, screaming and getting angry will only scare your dog, even if the anger isn’t aimed at them. Dogs can pick up on our emotions and can sense when we are angry, or sad. By losing your temper, your dog will feel uneasy too, and your relationship will weaken because your dog will feel like he can’t rely on you. Your dog has his own ways of showing you that he loves you, some of which are subtle, and some are just plain obvious like giving you a big greeting when you come home. So, make sure you let your dog know how much you love him. Show your love by doing things that your dog enjoys. Give your dog some belly rubs, play his favorite game, take him to the park, or spoil him with his favorite treats, or food. No, I don’t actually mean bark at your dog, but be aware of your dogs body language. Dog’s can’t speak to us and tell us how they are feeling, but their body language can tell us so much. The position of your dogs tail, the way it’s wagging, the direction of his ears, and the look in his eyes, almost every part of your dogs body is a sign of what he’s feeling or thinking. By understanding your dogs body language, you will be able to tell when your dog is happy, feeling frightened or anxious. You will be able to identify your dogs signals of when he is scared, and it will be easier for you to protect your dog or avoid situations that make your dog uncomfortable. Your bond will be stronger, because your dog will be able to count on you and trust you to keep him safe. Physical contact with your dog creates a stronger bond. Some dogs thrive on physical contact, touching and petting your dog will not only help to lower your stress, but it’s a great way to lower stress levels in your pooch. Grooming your dog is a great bonding experience. Your dog will love the one on one time with you, and all the attention he is getting. Certain parts of grooming makes dogs feel uncomfortable, and they just don’t like it, such as nail trimming, having a bath, and ear cleaning, those things probably won’t lower the stress levels in your dog, but brushing is something most dogs enjoy. Dogs love to be on a schedule and follow a routine every day, it makes them feel safe and secure. They love the security of being walked, and fed at the same time every day. So how does messing with their routine create a stronger bond? By doing different things now and then, you will keep things exciting for your dog. Your dog will learn to focus on you and learn that he has to be in tune to you. Doing different things with your dog doesn’t have to happen all the time, but just adding a bit of surprise now and then is a good thing. 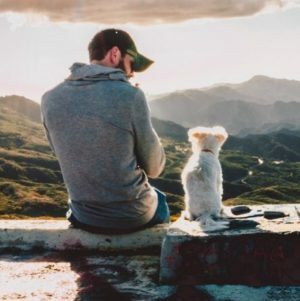 You could go on a road trip together, explore a new neighborhood to walk, surprise your dog with a new toy, or give your dog a new treat that he’s never tried before. Having a bond with your dog grows stronger over time, and is essentially the glue that holds your relationship together. The bond you share with your dog should be based on mutual respect, trust, and understanding. 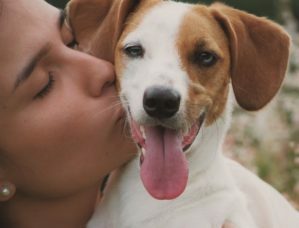 To deepen your relationship and feel more connected with your dog it is important to put in the effort and time that it takes. Bonding is all about spending time together, sharing new experiences, playing together, understanding each other, and letting your dog know how much he means to you. 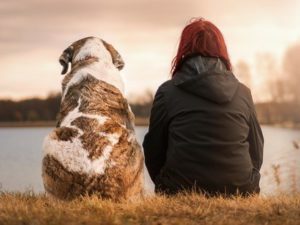 By following the above mentioned tips for bonding with your dog, you and your dog will share a close connection and truly be best friends. Do you have any tips for bonding with your dog? Share your thoughts in the comments below. What an inspirational article! Although, I’m part of the silent population that really hates dogs, since childhood. While everyone around me is happily petting dogs, tagging each other in puppy memes and dreaming about their future dogs, I’m part of the rare breed whose tail doesn’t wag at the faintest sight of the four-legged creatures. Not that I suddenly hate dogs, but because of my first contact with my Uncle’s fierce dog that nearly bit me during my childhood. Eventually, when I was older, I knew the importance and love people have towards this wonderful pet. My parents made me to know that dog is man’s best friend, but they never had one. I started to have some love for dogs after reading some inspirational tips about this pet in the article. I would like to have a start with this pet. I will find this article really useful when I have one, every relationship takes real work. For the bonding to be strong, I will start a good relationship with the dog as soon as I bring the dog home. Hope the previous hatred won’t seem to show during the process. Thank you for taking the time to comment. I am sorry to hear that your experience with dogs is that of a negative one. I believe many people who dislike dogs, have had some sort of bad experience with them. Being bitten, or almost being bitten by a dog would certainly be a traumatic experience. I am glad to hear that you have started to have some love towards dogs. There is no greater relationship than the one you can have with a dog. A dog will love you no matter what, and will always be there for you. I truly believe that you can have a close bond with a dog, and it starts as soon as you bring your dog home. I have always liked dogs, but when you have a dog of your own, you really love that dog like it is your child. Thank you for sharing your experience, and I hope that if and when you decide to get a dog of your own, you will come back to my website for useful information. I am happy to help you out. As a dog owner, I know the importance of forming a close bond with my dog. I really can’t explain how it happened, but my dog has also come to realize that he is an important part of the family. He is able to tell when I am unhappy, unwell or anxious. Just by reading my facial expression, he knows when to come close or wag his tail from a distance. Curiously, he is also able to accord the same respect and welcome to my grandparents, even when meeting them for the first time. This bond is so close that even when we are having a serious family discussion, he sits in (although having nothing to contribute). Thanks for sharing your personal 11 tips for bonding with a dog. Regardless of how I feel, I always make out time to play with my dog and show him some love. I already use some of them while quite a few are entirely new to me. Please keep writing educative articles like this for dog owners like myself. It is great to hear that you and your dog have a strong bond. Dogs really are in tune with our feelings, and can sense when we are feeling sad or angry, or are sick. They know just how to comfort us. They really are part of the family, and it sounds like your dog really feels like an important family member. I am sure he feels loved and appreciated, because you are able to make time for him even when you are not feeling well. Thanks for sharing your experience, and I am glad you enjoyed my post. I must say that this article is very interesting and thorough. Dogs are the best human friends and they are so loyal and cute. I actually have two dogs, male and female, they are actually husband and wife lol. We are together for over 5 years and I know everything about them and they about me, your article helped me to see what I can do more for them. I think it’s great that your 2 dogs have a close bond with you, and with each other. Relationships can always be reinforced throughout the life of your 2 dogs, simply by showing them how much you love them, and how much they mean to you. The truth is every relationship takes time before they bond or get fond of each other, and the same applies to bonding with your dog. My experience on this is a funny one. So, I got a bull dog for myself and I assumed it shouldn’t take too long before we become buddies. So I came home that day expecting to get a welcome bark, but instead I got a very threatening one. Until I started attending to my dog and giving him full attention by personally serving his food and all, was when we truly bonded. They also yearn for your attention. Thank you for sharing your experience. Many dog owners assume that their dog will bond with them right away, but the bonding process takes time, in order to establish mutual trust and respect. It’s all about getting to know one another, and spending time together, as you have learned.